Tonight is my last night in my bed, with a bedside lamp and drinking a beer. Tomorrow I head back to Fenty and the 3BCT 25th Division. I am very excited to see old friends and how they fare. My emotions vacillate from excitement to apprehensiveness. I find myself doing superstitious things, like packing the same exact things I packed the last two times I embedded and trying to follow the same ritual of a last beer or staying up late or making sure I have a copy of my passport and of course writing a note to each daughter about how proud I am of them and how much I love them. I am a lucky one...I have lived an amazing life, done what I've wanted to do and no one can take any of my memories or accomplishments away from me. I have just one more mission to achieve...to be a voice for the warrior that takes their time to talk to me and tells me about what's on their mind. And to let them know their appreciated by civilians like me. I can't help but think about the soldier who went crazy and murdered innocent children and wonder what happened. There has been a lot of blood spilled in Afghanistan...I'm surprised the dirt is not red. 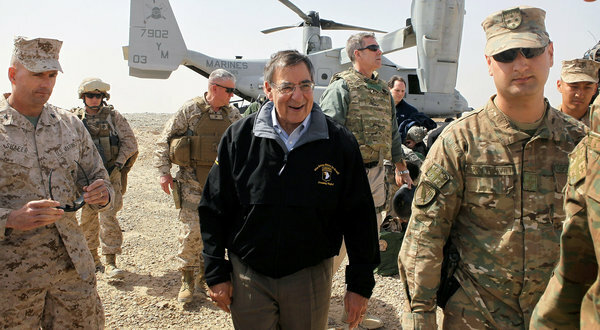 Defense Secretary Leon E. Panetta arrived at Forward Operating Base Shukvani, Afghanistan, on Wednesday. KABUL, Afghanistan — A tense visit to Afghanistan by Defense Secretary Leon E. Panetta got off to an unscripted start when a stolen truck sped onto a runway ramp at the British military airfield as his plane was landing. Mr. Panetta was unhurt, but Pentagon officials said the Afghan driver emerged from the vehicle in flames. Glad I'm not going to Helman! This is tragic and ironically the solider is from the same part of Washington as the other Marines who committed the horrific murders for war trophies before. The Taliban's website describes the massacre as a "continuation of the past acts of terror by the American monsters" and vows revenge. "The Islamic Emirate assures survivors of the incident that it will, with God Almighty's assistance, avenge the martyrdom of each of the victims on the invading and beast-like murderers and punish them for their barbaric action," it says. The Pajhwok Afghani News has a very professional and insightful piece. The video is graphic. KANDAHAR CITY (PAN): A US soldier of the International Security Assistance Force ( ISAF ) was detained on Sunday in connection with shooting dead at least 17 Afghan civilians in the southern province of Kandahar, officials said.